Bielsa has a pupil, he just won the Copa Sudamericana by pretty much trashing anyone he played against, in an impressive fashion. In the build-up to the 2010 World Cup, Marcelo Bielsa's Chile side got just as much media attention as any of the traditional world powers. After a two-year absence from the tournament, Chile finished second in CONMEBOL World Cup qualifying with players that casual fans hadn't heard of before the qualifying tournament began. Thanks to Humberto Suazo's ten qualifying goals and Bielsa's preferred formation featuring three defenders, a playmaker and three forwards, they were as discussed as, and unavoidably linked to, group mates and eventual winners Spain. Chile won both of their first two matches before coming up against La Furia Roja, who defeated them in what should have been a fascinating tactical battle. Unfortunately, their clash was marred by some questionable officiating and penalty drama. They finished second in their group and were defeated soundly by Brazil in the Round of 16, but Chile left their indelible mark on world football with their performance. Bielsa was discussed frequently following the tournament and linked to various jobs before taking over at Athletic Bilbao, who have become a fascinating team under his short reign. Currently, the 'new Bielsa' is rising through the management ranks in South America. The man who has been stamped with that label, for better or for worse, is Jorge Sampaoli. Like Bielsa, Sampaoli is an Argentinian who has taken work in Chile. Like Bielsa, he started his career with Argentinian side Newell's Old Boys. And most importantly, like Bielsa, he favors a three-man back line, a playmaker and three forwards. At present, Sampaoli's Universidad de Chile side is the hottest team in South America. They're undefeated in their last 18 matches between the Chilean Primera Division and Copa Sudamericana, and they're doing it in style. La U have scored 33 times in 13 games so far in the 2011 Clausura and recently defeated Ronaldinho's Flamengo 4-0, away in Brazil. The two sides meet for the second leg of their Copa Sudamericana Round of 16 tie on Wednesday, and Sampaoli has little incentive to play his first team. Sampaoli took his first managerial job at Juan Aurich, a Peruvian club in 2002, but did not truly begin his rise to prominence until he took over Chilean side O'Higgins in 2008. In three consecutive seasons with La Celeste, Sampaoli guided them to the playoffs, attracting the attention of big clubs in other parts of South America. He was hired by Ecuadorian club Emelec in 2010, where he experienced some serious ups and downs. In a situation reminiscent of the one Bielsa faced in his first few months in charge of the Chilean national team, Sampaoli's side struggled at the beginning of his tenure. As he had arrived only weeks before the beginning of Copa Libertadores, he was not able to get his team to mesh in his system in time to do well in the tournament. He impressively defeated his former club Newell's to qualify for the group stages, but only amassed two points once there as Emelec was eliminated. He had similar issues domestically, but got the side turned around as Emelec won the first stage of the Campeonato Ecuatoriano de Fútbol de la Serie A, then finished second in the second stage and top of the aggregate table. This qualified them for the league final against Ecuadorian giants and 2008 Copa Libertadores champions LDU Quito. His side lost 2-1 on aggregate, as LDU star midfielder Miller Bolaños scored a 92nd minute backbreaker in his side's home leg, but Sampaoli's reputation as one of the top managers in South America was cemented, and he made another move up the coaching ladder when he took over Universidad de Chile in the start of 2011. La U finished second to Universidad Catolica in the regular season table in Sampaoli's first season in charge, but they ran riot through the playoffs, sealing two particularly improbable wins to capture the title. After getting through the first round with a 3-2 victory over Union San Felipe and winning the first leg of their semifinal 1-0 over O'Higgins, La U dropped one of the most impressive results on this side of the earth in the second leg. La U dropped a 7-1 victory on Sampaoli's old side, advancing to the final against Universidad Catolica. UC won the first leg 2-0, presenting an almost impossible task for La U in the second leg, but Catolica completely imploded, committing silly fouls and losing their positional discipline en route to a 4-1 loss that gave La U the title by an aggregate score of 4-3 in the final. Now, 13 games into the second tournament of the year in Chile, La U have 10 wins, three draws, and no losses. They're eight points clear of their opposition at the top of the table, and they're 12 points clear at the top of the aggregate table that takes both tournaments into accounts, in which the top team drops directly into the second stage of Copa Libertadores. A combination of Sampaoli's system, some emerging stars and his ability to place departed players with both diamonds in the rough and up-and-coming youngsters has contributed to the team's success so far. For those unfamiliar with Bielsa's Chile and other instances of the 3-3-1-3/3-4-3 system, it looks like this under Sampaoli. The right forward, Eduardo Vargas, is the best of the bunch. As a 22-year-old, he's represented Chile seven times, scoring two goals. In the absence of Alexis Sanchez during the first set of CONMEBOL World Cup 2014 qualifying fixtures and going into the November qualifiers, he's been tipped as the man to replace Sanchez on a temporary basis for La Roja. He does not have the raw talent of the Barcelona man, but he is similar in body type and style of play, and is likely to make a fantastic deputy for Sanchez for years to come. Their playmaker, Gustavo Lorenzetti, is a true diamond in the rough. With the Argentine Primera becoming a more physical league that favors larger playmakers like Ricky Alvarez and Erik Lamela, smaller No. 10s have moved elsewhere to make a career for themselves. He moved to Chilean side Universidad de Concepcion in 2007, making a career move similar to Flamengo's Dario Botinelli, Cruz Azul's 'Chaco' Christian Gimenez, and former Fluminense star Dario Conca. He's settled in wonderfully with La U since making the switch from Universidad de Conception and is just as important to the side as Vargas. The presence of Vargas and Lorenzetti causes center forward Fransisco Castro to be underrated, but the 21-year-old has quickly established himself as an important part of the side and has already earned two caps for Chile. His work rate from the center forward position is fantastic, giving him value beyond his lethal finishing skills. 'Prince' Charles Aranguiz and wing backs Eugenio Mena and Matias Rodriguez provide a lot in the way of work rate as well, giving the side a fantastic balance. In addition to getting these players, both new and established to click and play to the best of their abilities, Sampaoli has also done a fantastic job at minimizing the impact from the club's losses. Just months after defensive midfielder Manuel Iturra left, another defensive midfielder, Felipe Seymour, left the team for Genoa in May of 2011. Seymour unquestionably would have been a major key in La U's team going forward, and Sampaoli had to replace him. Apparently, he had an adequate replacement just waiting in his side. That player was just playing a different position. 24-year-old Marcelo Diaz has never had a 'true position', playing all over the pitch. The diminutive midfielder had spent some time in the center prior to this tournament, but was primarily a wide player. He's become the replacement for Seymour, filling in brilliantly in a defensive midfield role that is more demanding than the defensive midfield role often is in other systems. Diaz's ability to easily replace Seymour has to at least be partially credited to Sampaoli, as a drop-off in quality from that position and an increase in goals conceded almost seemed like a foregone conclusion when Seymour exited. In addition to Seymour and Iturra, La U has also lost Edson Puch to Diego Maradona's fabulously wealthy Al-Wasl team and goalkeeper Miguel Pinto to Club Atlas in Mexico over the last two years. Aranguiz and Jhonny Herrera have replaced them without issue. And then there's the youngsters. The most heralded of them all is Angelo Henriquez, a 17-year-old striker/winger who was recently handed his first team debut. He's scored three goals in four games for the U-17s and is considered one of the brightest young talents in Chile. He's so widely regarded that Manchester United have reportedly already secured a first option to purchase him. Henriquez is just one of the talented young players coming through the ranks, though. Key attacking bench player Felipe Gallagos is just 19-years-old, while a half dozen other teenagers have been handed debuts in the past year. La U is a team preparing for the inevitable departure of their stars, and they could be turning into a talent factory on the scale of some of the biggest clubs in Argentina and Brazil. This policy provides just another point of comparison between Sampaoli and Bielsa, who brought a number of unknown young players through the ranks in his time in charge of the Chilean national team. However, while there are a number of striking similarities between Sampaoli and Bielsa, the most obvious of which is the formation and style of play of their teams, they are not the same manager. Bielsa's nickname is 'El Loco', earned for a variety of reasons. Sampaoli doesn't deserve that tag - or anything similar - partially because he's a less animated than the man he looks up to and his sides are significantly more disciplined. Universidad de Chile is a more organized team with better positional discipline than Bielsa's Chile side, and the same can be said about La U compared to the current Athletic Bilbao side. However, that could possibly be down to the amount of time that a manager has to work with a national side under most circumstances and the amount of time Bielsa has had with Athletic Bilbao so far. Bielsa hasn't had a long-term role with a club team since 1998, so it's quite possible that discipline will come, but at present Sampaoli's side seems more adept in that regard. Sampaoli is also not the same manager because he's already 51 years of age. Bielsa took his first managerial job at the age of 34, moved to Espanyol at 42, and became manager of Argentina at 43. Conversely, Sampaoli took his first managerial job at 41 and has yet to manage outside of South America. Perhaps, due to his late start in management and his current age, his chances of making it in Europe are small. However, both Manuel Pellegrini and Luiz Felipe Scolari were in their 50s when they took their first job across the Atlantic. So, what's next for Sampaoli and La U? The domestic playoffs are a given with the team so far clear at the top of the table, and they will be favorites when they get there. Arsenal di Sarandi is next up in Copa Sundamericana - assuming they don't lose their 4-0 lead - and their defense has been poor this season. The road to the final is paved with average teams for La U, where they will likely face one of the giants of the South American game. They're going to compete in the 2012 Copa Libertadores, and the bar for success was set just a couple of years ago. A completely different kind of Universidad de Chile side made an impressive run to the semifinals of the 2010 competition, defeating Alianza Lima and Flamengo in the knockout stages. 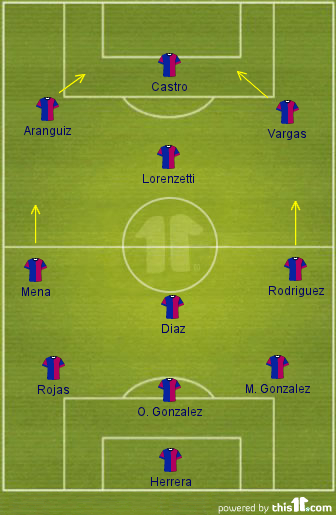 That team, much like the Peñarol and Cerro Porteño sides that had success in the 2011 edition of Copa Libertadores, was primarily a counter-attacking side. That has proven the recipe for teams outside of Argentina and Brazil to compete for the big boys in South America's premier competition, but Sampaoli's team seem intent on trying something different. If Universidad de Chile can take down the big sides in Argentina and Brazil in both the Copa Sudamericana and Copa Libertadores while playing with un enganche y tres punta, it will be a fantastic accomplishment. Hopefully, if it happens, it gets people outside of South America talking about the work that Jorge Sampaoli has done, following the principles and system made well-known around the world by Marcelo Bielsa. Come across this guy before in other reading. From that, he appears a little more pragmatic and has no problems dropping the lines back deeper and playing counter ball. Someone do me a favor and make a brief ver. whats so special of him? Thanks for the bump Nick, I didn't see this thread the first time around. Definitely Sampaoli is a very promising manager. This guy should coach Napoli! In the presence of more illustrious South American nations - Brazil’s financial strength allowing clubs to compete with their European counterparts, Argentina’s continued production of the world’s most sought after forwards and Uruguay’s successful national team, reaching the World Cup semi-final and winning the Copa America in the last 18 months with a population similar to Wales – Chilean football is silently flourishing. Or it was, until Universidad de Chile, known as La U, decided to attract attention to the west coast of South America by creating history and breaking records, all while playing some of the most exciting football in world football. On the 15th of December they won their first international trophy in their first ever final; defeating LDU Quito of Ecuador 3-0 in Santiago, following up their 1-0 success in Ecuador the week previous, to lift the Copa Sudamericana, becoming the first Chilean side to do so. Not that long ago one of Chile’s most iconic clubs fell on hard times, falling into bankruptcy in 2006 before being taken over a year later by a private consortium called Azul Azul. Now, four years later, the team have just won the Torneo Clausura (Closing Tournament) completing an unprecedented treble with the Copa Sudamericana and Torneo Apertura (Opening Tournament) already in the trophy cabinet, helped by a mammoth 36 game unbeaten run which came to an end in the dying seconds of the Clausura play-off semi-final with rivals Universidad Católica with La U already through. And much of the transformation can be put down to one man, Argentine coach Jorge Sampaoli who took over for the start of the 2011 Torneo Apertura. With a reputation as a Marcelo Bielsa disciple he began, like Bielsa did, managing the youth teams of Newell’s Old Boys. However it was outside his country of birth that he got his break in management. A five year stay in Peru saw Sampaoli take in spells with differing success at Juan Aurich, Sport Boys, Coronel Bolognesi and Sporting Cristal before his first job in Chile with O’Higgins. He took the modest Rancagua side to three consecutive play-off tournaments and qualification to the Copa Sudamericana. Ignored by clubs in his homeland and Brazil his success with La Celeste alerted Ecuador’s Emelec. In his year in charge of El Bombillo he overcame doubts from fans and media, leading the team to an opening championship win and into the two-legged grand final against none other than LDU. 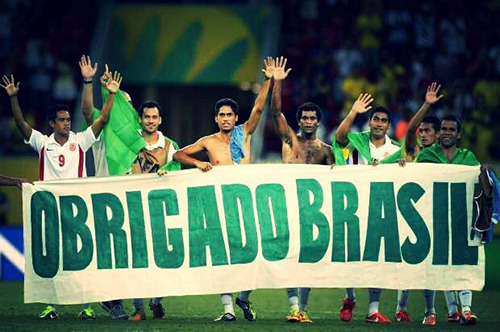 Even though they lost the final they took their place in the 2010 Copa Sudamericana and 2011 Copa Liberatadores. Yet an opportunity arose back in Chile with Universidad de Chile. The club had won only one Apertura Championship since 2004 and the fans wanted a big name to lead their club. Ex- Argentina midfielder and former Catania manager Diego Simeone was among those shortlisted but Sampaoli was appointed. The appointment left the Azul Azul fans underwhelmed but the directors bought into his vision for the club. A positive start – four wins and a draw from his first five games – was not enough for fans who had labelled Sampaoli as ‘El Bielsa de los Pobres (‘The Bielsa of the poor’). Some did not take to the way he re-shaped the team with a number of players including the experience and quality of Manuel Iturra, Walter Montillo, Miguel Pinto and Rafael Olarra moving on; players who were the hallmark of the clubs run to the semi-finals of the Copa Liberatadores in 2010. But Sampaoli had a plan. He always has a plan. He soon brought back goalkeeper Jhonny Herrera and defender Marcos González to the club along with Albert Acevedo, Charles Aránguiz and striker Gustavo Canales on a club record-breaking deal – £825,000 – from Unión Española while promoting and playing young talent already at the club. Relegating club icons like Diego Rivarola to a bit-part role frustrated fans but it would be easier for the Argentine to impart his philosophy into the squad with younger, less experienced players; a Bielsa theory. Sampaoli led his new team to instant success; second in the Apertura and to the play-off final against rivals Universidad Católica. Sampaoli wanted his side to break from the clubs ‘traditional’ way of playing, much to the chagrin of fans, and adopt a high-tempo, dynamic and fluid system centred on an intense pressing game that would suffocate teams into submission. A 3-4-3 or 3-3-1-3 system was implemented with fitness and technical competence essential; wide players able to dominate their flank, central defenders comfortable in wide areas and mobile and creative midfielders. There are no fitting square pegs in to round holes, each player capable of adapting to different positions, situations and systems. An 8-1 semi-final win over O’Higgins set up the Clásico Universitario final but Sampaoli’s first six months in charge looked like ending in disappointment, losing the first-leg at home 2-0. But it all came together in the return leg as La U overran Católica winning 4-1. That game could be identified as the turning point because what was about to transpire would be truly magical. The summer brought about more departures as Felipe Seymour and Edson Puch left but it allowed Sampaoli to recruit the last pieces, completing his puzzle; Gustavo Lorenzetti and Osvaldo González arrived. That summer also saw defeat to Primera B side Magallanes in the Copa Chile. 14/07/2011 the date. The last loss La U would suffer. Nine straight wins would kick start the Clausura season, setting a new Chilean record for consecutive wins, beating the feat of eight wins recorded by Cobreloa (1978) and Colo Colo (2007). Participation in the Copa Sudamericana games would see games come thick and fast and the perfect start in the Clausura allowed for rotation to a squad thriving with young talent. As the squad continued to remain unbeaten throughout the Clausura season it was in continental competition that the team blossomed; the players on the field and Sampaoli off it. Bielsa is renowned for taking 2,000 videos packed with match footage with him to the 2002 World Cup when in charge of Argentina. Similarly Sampaoli immerses himself into improving his team any way he can, working long hours, almost to the point where one shift merges with the next then the next. Off the field he is quiet and conservative. On it, white Adidas baseball cap stuck to his head, he can be seen storming around his technical area. But always studying, calculating, thinking. Looking for even the smallest of advantages. Striving for perfection. This insight could be seen in some of Sampaoli’s decisions throughout the Copa Sudamericana campaign. In the first-leg of the final he withdrew a forward from his usual starting line-up to position Acevedo in front of the defence in a 3-1-4-2 system, frustrating LDU and winning at the altitude of Quito. Even when he did get it wrong he was quick to respond. Playing against Vasco da Gama Lorenzetti played behind three forwards in a 3-3-1-3 but seeing that it wasn’t working Sampaoli replaced him with Matías Rodríguez in the first-half, recovering to draw 1-1. No stubbornness. No indecisiveness. Only what is best for the team. It was one of few imperfections in the sides run to Copa Sudamericana success; 12 games, 10 wins, 2 draws, 21 scored, 2 conceded. On top of their 36 games unbeaten La U broke the Chilean record for the longest time – 543 minutes – without conceding in international competition, the tournament record for least goals conceded and the best overall record in the tournaments history. The comparisons with Bielsa do not appear to concern Sampaoli who openly admits his admiration for Bielsa: “I always set the team out to Bielsa’s philosophy . . . to show great intensity and control.” And it was only been too evident in their dispensing of Uruguay duo Fénix and Nacional, Brazil’s Flamengo and Vasco da Gama, Argentina’s Arsenal de Sarandí and LDU. The energetic play of wing-backs Rodríguez and Eugenio Mena, dynamism and guile of midfielders Marcelo Díaz, Aránguiz and Lorenzetti, the speed of Francisco Castro all complemented by star man Eduardo Vargas. The performance that encapsulated it all was the Last 16 away-leg in Brazil against a Flamengo side containing Ronaldinho. A devastating show of aggression, pace, pressing, control and quality in all areas of the pitch saw Universidad de Chile stroll out of the Engenhão 4-0 winners as South America sat up and took notice. The ‘Xavi’ of the team, Marcelo Díaz, was missed but is an essential cog in front of the back three through his reading of the game and positioning to receive a pass at all time. A player who was previously used in a variety of positions Sampaoli made Díaz the base of the team able to slow the game down but more importantly speed it up when La U hit teams with rapid attacks. However the man everyone wants to talk about is forward Eduardo Vargas. Internazionale, Chelsea, Manchester City and Villarreal were among those who sent scouts but the forward will join Napoli for around £11m. The eleven goals he scored in the campaign make him the competitions highest scorer beating Humberto Suazo’s record of ten and his 13 goals in continental competition altogether takes him past Marcelo Salas’ club record in CONMEBOL competitions. The high-intensity system is perfect for him, playing on the right of a front three – but equally capable in each position. As quick with the ball as he is without it, he combines a low centre of gravity to bounce off challenges with his impeccable fitness, ideal when pressing from the front. He has perfected the out-to-in run from wide, using it to great advantage – including a goal for Chile; the second of two in seven caps. Defenders have to be wary not to allow him to turn with the ball or leave space in behind; his goal in the second-leg of the final shows him at his breathtaking best. He will be sorely missed but there is talent waiting in the wings; Felipe Gallegos, 18-year-old Christian Bravo and recent signing Junior Fernandes. A bigger miss however would be Sampaoli who has admitted to being interested in the Chile job when Claudio Borghi exits. But his departure is unlikely in the short-term and in the New Year all eyes will be on the team of the moment in the Copa Liberatadores to see if they can complete a continental double, turning their 84 year wait for an international trophy in to two in the space of a year. Not too bad for ‘El Bielsa de los Pobres’. A more apt nickname may now be ‘El Perfeccionista’. Sampaoli lead his Universidad de Chile to a 5-0 win over their fiercest rivals, Colo Colo in the Chilean equivalent of "El Classico"
Sampaoli has been contacted by Estudiantes to take over. Estudiantes are a strong team, but play defensive football and are not known for their technical qualities. It'd be interesting to see if he can completely convert their style. Didn't Matias play at Boca? Anyways damn, it looks like you're right, he's a Boca product. Maybe I should stop asking for his NT call-up? LDU is just a much more experienced side when it comes to International competitions. Veron wanted the job I heard. @BC, how highly do you rate Matias Suarez? Never seen him play, don't really watch Anderlecht very often. Oh lol, i meant Matias Roddriguez? The formation displayed on the OP tells it all really. In Pes i use the same strategy with the wingers going into the center. The only difference between his formation and mine is the Defensive four. I use a Box Shape while Sampaoli's is Diamond Shaped. A 3-1-2-1-3 to be presicse. In my formation I push my 2 DM's a little wider, and push my CB's higher when Attacking and i force them to close towards the middle while Defending. Sampaoli's Diamond makes me think his DM and his side CB's are all used for Attack while leaving 1 Defender at the back.